We've got everything you need…..almost. Well the White Bass run is officially on in the Colorado River here at the Bend. The fact is the river is in great shape and fisherman have been catching their limits on Whites regularly. Some have reported catching the limit(25) in an hour or less, that’s about a fish every couple of minutes. What most have had good results with are minnows, plastic jigs, white, white/red, Chartreuse, Chartreuse/red, gray, white/gray have all been working well with spinners and without. 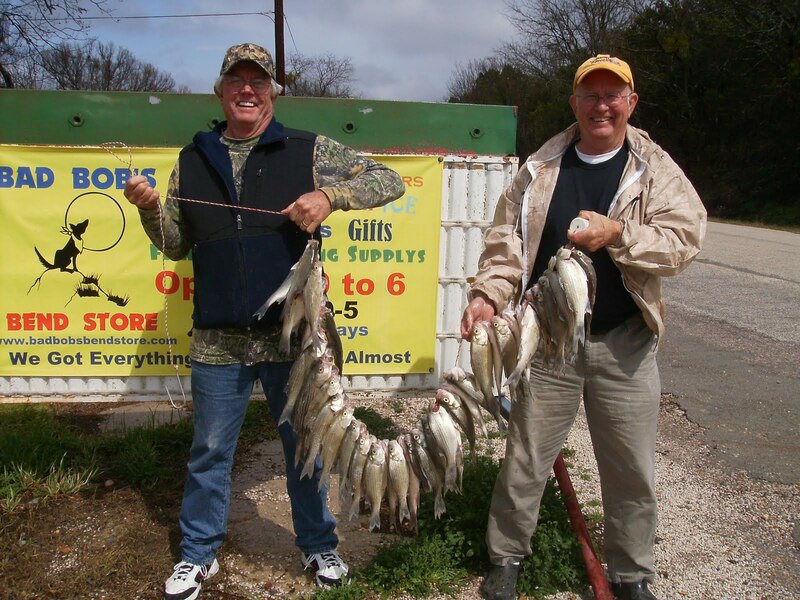 Most of the whites are being caught at the Colorado Bend State Park but Sulpher Springs Camp also has had white’s caught and Barefoot Fishing Camp has also had a few reeled in. Lots of Catfish, both Blue’s and Channel have been caught this past week as well using cut bait, nightcrawlers and Big Marv’s Cheese bait. Nightcrawlers and minnows also have landed many Buffalo,Carp and Gaspergoo which are a lot of fun to reel in. All and all the fishing at the Bend has been EXCELLENT ! We have the photo’s to prove it as you can see and all these were caught this past week. So what ya waiting for, load up the truck with your gear, put it in gear and get on out here and if you forget something stop by Bad Bob’s Bend Store, we got everything you need ……..ALMOST ! Remember to bring your catch to the store for a photo shoot and we’ll feature you on the next report. This is the best bass run and river conditions in the past 4 or 5 years so don’t miss out and we hope to see you soon. Bad Bobs Bend Store Create a free website or blog at WordPress.com.